ABS brakes on a BMW Bike. 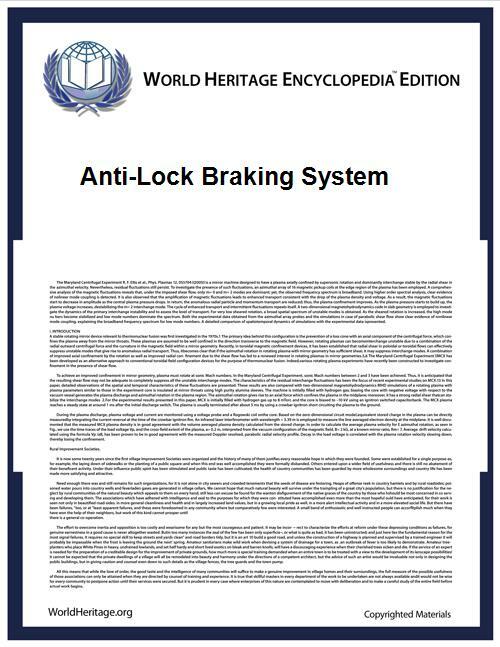 Anti-lock braking system (ABS) is an automobile safety system that allows the wheels on a motor vehicle to maintain tractive contact with the road surface according to driver inputs while braking, preventing the wheels from locking up (ceasing rotation) and avoiding uncontrolled skidding. It is an automated system that uses the principles of threshold braking and cadence braking which were practiced by skillful drivers with previous generation braking systems. It does this at a much faster rate and with better control than a driver could manage. ABS generally offers improved vehicle control and decreases stopping distances on dry and slippery surfaces for many drivers; however, on loose surfaces like gravel or snow-covered pavement, ABS can significantly increase braking distance, although still improving vehicle control. Since initial widespread use in production cars, anti-lock braking systems have been improved considerably. Recent versions not only prevent wheel lock under braking, but also electronically control the front-to-rear brake bias. This function, depending on its specific capabilities and implementation, is known as electronic brakeforce distribution (EBD), traction control system, emergency brake assist, or electronic stability control (ESC). ABS was first developed for aircraft use in 1929 by the French automobile and aircraft pioneer Gabriel Voisin, as threshold braking on airplanes is nearly impossible. These systems use a flywheel and valve attached to a hydraulic line that feeds the brake cylinders. The flywheel is attached to a drum that runs at the same speed as the wheel. In normal braking, the drum and flywheel should spin at the same speed. However, if a wheel were to slow down, then the drum would do the same, leaving the flywheel spinning at a faster rate. This causes the valve to open, allowing a small amount of brake fluid to bypass the master cylinder into a local reservoir, lowering the pressure on the cylinder and releasing the brakes. The use of the drum and flywheel meant the valve only opened when the wheel was turning. In testing, a 30% improvement in braking performance was noted, because the pilots immediately applied full brakes instead of slowly increasing pressure in order to find the skid point. An additional benefit was the elimination of burned or burst tires. By the early 1950s, the Dunlop Maxaret anti-skid system was in widespread aviation use in the UK, with aircraft such as the Avro Vulcan and Handley Page Victor, Vickers Viscount, Vickers Valiant, English Electric Lightning, de Havilland Comet 2c, de Havilland Sea Vixen, and later aircraft, such as the Vickers VC10, Hawker Siddeley Trident, Hawker Siddeley 125, Hawker Siddeley HS 748 and derived British Aerospace ATP, and BAC One-Eleven being fitted with Maxaret as standard. Maxaret, while reducing braking distances by up to 30% in icy or wet conditions, also increased tyre life, and had the additional advantage of allowing take-offs and landings in conditions that would preclude flying at all in non-Maxaret equipped aircraft. Chrysler, together with the Bendix Corporation, introduced a computerized, three-channel, four-sensor all-wheel ABS called "Sure Brake" for its 1971 Imperial. It was available for several years thereafter, functioned as intended, and proved reliable. In 1970, Ford added an antilock braking system called "Sure-track" to the rear wheels of Lincoln Continentals as an option; it became standard in 1971. In 1971, General Motors introduced the "Trackmaster" rear-wheel only ABS as an option on their rear-wheel drive Cadillac models and the Oldsmobile Toronado. In the same year, Nissan offered an EAL (Electro Anti-lock System) as an option on the Nissan President, which became Japan's first electronic ABS. In 1972, four wheel drive Triumph 2500 Estates were fitted with Mullard electronic systems as standard. Such cars were very rare however and very few survive today. In 1988, BMW introduced the first motorcycle with an electronic-hydraulic ABS: the BMW K100. Honda followed suit in 1992 with the launch of its first motorcycle ABS on the ST1100 Pan European. In 2007, Suzuki launched its GSF1200SA (Bandit) with an ABS. In 2005, Harley-Davidson began offering ABS as an option for police bikes. Typically ABS includes a central electronic control unit (ECU), four wheel speed sensors, and at least two hydraulic valves within the brake hydraulics. The ECU constantly monitors the rotational speed of each wheel; if it detects a wheel rotating significantly slower than the others, a condition indicative of impending wheel lock, it actuates the valves to reduce hydraulic pressure to the brake at the affected wheel, thus reducing the braking force on that wheel; the wheel then turns faster. Conversely, if the ECU detects a wheel turning significantly faster than the others, brake hydraulic pressure to the wheel is increased so the braking force is reapplied, slowing down the wheel. This process is repeated continuously and can be detected by the driver via brake pedal pulsation. Some anti-lock systems can apply or release braking pressure 15 times per second. Because of this, the wheels of cars equipped with ABS are practically impossible to lock even during panic braking in extreme conditions. A speed sensor is used to determine the acceleration or deceleration of the wheel.These sensors use a magnet and a coil of wire to generate a signal. The rotation of the wheel or differential induces a magnetic field around the sensor. The fluctuations of this magnetic field generate a voltage in the sensor. Since the voltage induced in the sensor is a result of the rotating wheel, this sensor can become inaccurate at slow speeds. The slower rotation of the wheel can cause inaccurate fluctuations in the magnetic field and thus cause inaccurate readings to the controller. The pump in the ABS is used to restore the pressure to the hydraulic brakes after the valves have released it. A signal from the controller will release the valve at the detection of wheel slip. After a valve release the pressure supplied from the user, the pump is used to restore a desired amount of pressure to the braking system. The controller will modulate the pumps status in order to provide the desired amount of pressure and reduce slipping. The controller is an ECU type unit in the car which receives information from each individual wheel speed sensor, in turn if a wheel loses traction the signal is sent to the controller, the controller will then limit the brake force (EBD) and activate the ABS modulator which actuates the braking valves on and off. This replaces the need to manually pump the brakes while driving on a slippery or a low traction surface, allowing to steer even in the most emergency braking conditions. When the ABS is in operation the driver will feel a pulsing in the brake pedal; this comes from the rapid opening and closing of the valves. This pulsing also tells the driver that the ABS has been triggered. Some ABS systems can cycle up to 16 times per second. ­Anti-lock braking systems use different schemes depending on the type of brakes in use. They can be differentiated by the number of channels: that is, how many valves that are individually controlled—and the number of speed sensors. This system, commonly found on passenger cars from the late '80s through early 2000s (before government mandated stability control), uses a speed sensor at each wheel, with one control valve each for the front and rear wheels as a pair. If the speed sensor detect lock up at any individual wheel, the control module pulses the valve for both wheels on that end of the car. This system is commonly found on pickup trucks with rear-wheel ABS. It has one valve, which controls both rear wheels, and one speed sensor, located in the rear axle. This system operates the same as the rear end of a three-channel system. The rear wheels are monitored together and they both have to start to lock up before the ABS kicks in. In this system it is also possible that one of the rear wheels will lock, reducing brake effectiveness. This system is also easy to identify, as there are no individual speed sensors for any of the wheels. Decreased the risk of run-off-road crashes by 35 percent. When activated, some earlier ABS systems caused the brake pedal to pulse noticeably. As most drivers rarely or do not brake hard enough to cause brake lock-up, and drivers typically do not read the vehicle's owners manual, this may not be noticeable until an emergency. Some manufacturers have therefore implemented a brake assist system that determines that the driver is attempting a "panic stop" (by detecting that the brake pedal was depressed very fast, unlike a normal stop where the pedal pressure would usually be gradually increased, Some systems additionally monitor the rate at the accelerator was released) and the system automatically increases braking force where not enough pressure is applied. Hard or panic braking on bumpy surfaces, because of the bumps causing the speed of the wheel(s) to become erratic may also trigger the ABS. Nevertheless, ABS significantly improves safety and control for drivers in most on-road situations. ABS are required on all new passenger cars sold in the EU since 2007. In the United States, the NHTSA has mandated ABS in conjunction with Electronic Stability Control under the provisions of FMVSS 126 as of September 1, 2011. ^ a b Reynolds, Jim (1990). Best of British Bikes. Patrick Stephens Ltd.
^ "History". We Love Cadillacs. ^ "Electro antilock system (installed in Nissan President)". 240 Landmarks of Japanese Automotive Technology. Society of Automotive Engineers in Japan, Inc.
^ "ABS Frequently Asked Questions". ABS Education Alliance. 2004-05-03. ^ Gerald J. S. Wilde (1994). "7. Remedy by engineering?". Psyc.queensu.ca. Retrieved 2010-12-07.